Sunday August 8th 1897 I wrote some in the morning after finishing my work. I read a great part of the afternoon. Frank Stevens was here talking with Will. I went over to Emmas after supper for a little visit. Monday August 9th 1897 We went over the river this morning to see about getting berries. were caught in a shower. I sent word to River Junction about berries. I sewed on my wrapper in the afternoon. Will mowed weeds. 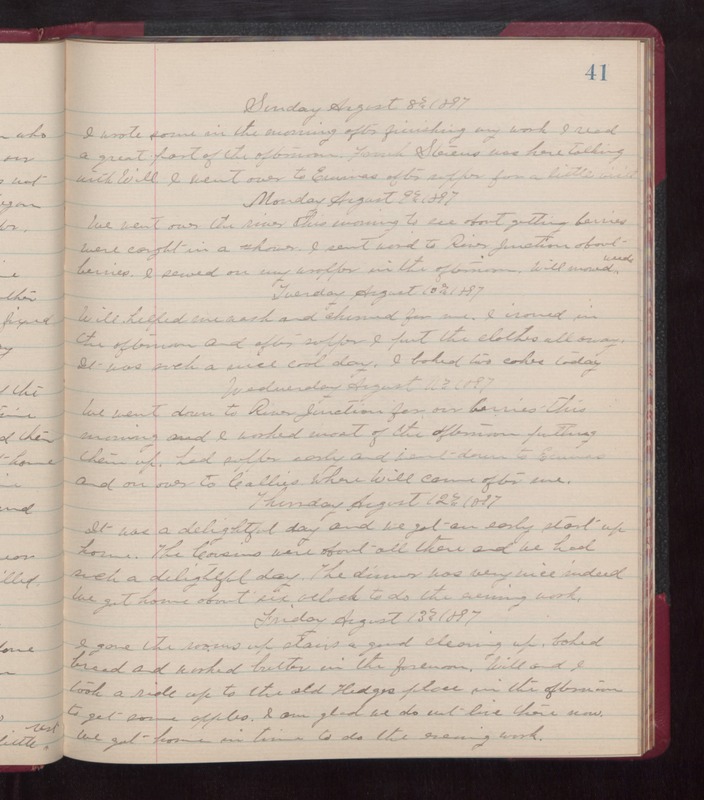 Tuesday August 10th 1897 Will helped me wash and churned for me. I ironed in the afternoon and after supper I put the clothes all away. It was such a nice cool day. I baked two cakes today. Wednesday August 11th 1897 We went down to River Junction for our berries this morning and I worked most of the afternoon putting them up. had supper early and went down to Emmas and on over to Callie's where Will came after me. Thursday August 12th 1897 It was a delightful day and we got an early start up home. The cousins were about all there and we had such a delightful day. The dinner was very nice indeed. We got home about six oclock to do the evening work. Friday August 13th 1897 I gave the rooms up stairs a good cleaning up, baked bread and work butter in the forenoon. Will and I took a ride up to the old Hedges place in the afternoon to get some apples. I am glad we do not live there now. We got home in time to do the evening work.